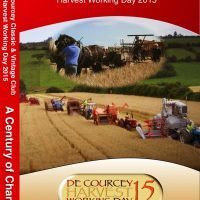 The hard working team of the De Courcey Classic and Vintage club are just settling down and relaxing, after the excitement of yet another wonderful August Bank Holiday ‘Harvest Day’ at Barrel’s Cross, Kinsale. Once again in 2014 crowds flocked to the farm of Jim and Eileen O’Regan at Coolyrahilly, Barrel’s Cross, Kinsale in County Cork. The many thousands who attended the event were not disappointed as the club committee and sponsors Mc & S Agri Sales Ltd, had prepared a very special day indeed. Of course with Mc & S on the team Courceys had to abandon their traditional red and white colours for the blue and yellow of Ford and New Holland. A break in activity was called at 1PM for the opening ceremony. The crowd was addressed by John O’Neill (Club Chairman), Jim O’Regan (landowner) and John McCarthy of Mc&S. The official opening was then performed by Mr Andrew Watson C.E.O. of New Holland UK and Ireland, who had travelled to Ireland especially for the event. Then it was down to work! A range of Ford and New Holland tractors from Keith Byran’s 1918 model F, to Jim O’Regan’s 2014 T7.260, gave an unforgettable display of ploughing. Donal McCarthy’s team of Clydesdale horses were joined by Fordson model F’s, N’s, Ford Nans, Majors and Dextas with a mixture of trailer and hydraulic ploughs. The thousand series up to the modern T6’s and T7’s with their huge reversible were all represented. There was plenty for the tractor enthusiast to enjoy and lots of cameras were out to capture the occasion. The final sequence in the ploughing area was a spectacular line up of the 24 participants in a single line spanning 96 years of progress. 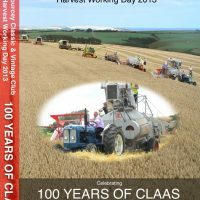 With the ploughing out of the way, the Claeys, Claysons and New Holland combines took up position for a unique formation harvesting display of 16 combines with Kinsale Harbour and the sea in the distance behind them. The earliest machine on site was a 1963 Claeys M103 owned by Michael Ryan, Ballinscarthy and the most modern was a 2014 New Holland CX6090 owned by Leonard Draper of Dunmanway. New Holland combines from each decade in between were present. The proceeds from this year’s event will be donated to Marymount Hospice, Ballinspittle and Ballinadee primary schools and to Courcey Rovers GAA underage teams. 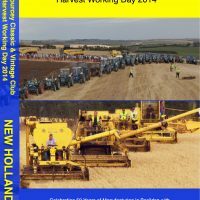 This entry was posted in New Holland, News and tagged 2014, Andrew Watson, Ballinadee, Ballinspittle, Claeys, Classic, Clayson, Courcey, Day, De, finale, Food, Ford, Fordson, Harvest, harvesting, Kinsale, Line up, marymount, New Holland, ploughing, Village, Vintage, Working on August 8, 2014 by admin.